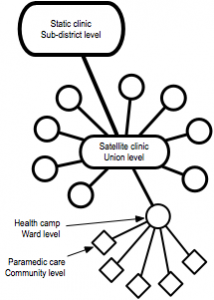 Extend the reach of our clinic (static clinic at the sub-district level) by establishing a satellite clinic at union-level, 9 ward-level health camps and a paramedic program at the community level (see Figure above). Provide affordable and accessible primary health care services through the development of a referral system that links local paramedic care, health camps, physician care at satellite clinic, static clinic and tertiary partner hospital in Dhaka (see video explanation here). Raise community awareness regarding nutrition, hygiene and reproductive health in collaboration with CBOs (particularly for women as domestic care-givers) by organizing training sessions (e.g. food gardens, first aid, hygiene and child feeding) and by establishing a resource center at the satellite center. Improve local management of the health care system by engaging CBO members in a trial to establish a non-profit, mutual, community-based health insurance scheme. We are still looking for support to expand this part of our work. Please find the attached proposal and don’t hesitate to contact us for more information.